Steps to a Rodent-Free Home - Yes Pest Pros, Inc. Steps to a Rodent-Free Home - Yes Pest Pros, Inc.
Rodents are a common problem among homeowners, much more common that most people would want their neighbors to know. These tenacious and wily creatures are a residential and commercial pest control issue. Every year mice, rats, squirrels and other rodents cause millions of dollars’ worth of damage to property. This is in addition to causing health issues and emotional distress. South Bend pest control agents typically meet with clients based on one or more of the following common local pests. The Norway Rat, rattus norvegicus. Also known as the brown rat, the Norway is a large, chunky rat often found living in close proximity to man. It likes tall vegetation for cover and food, but will eat nearly anything. The Roof Rat, rattus rattus. Also called the black rat, the roof rat is an omnivore that likes to eat seeds, nuts and fruits as well as fungi, small vertebrates and invertebrates. Larger and more aggressive than the Norway, it is also more adaptive to weather conditions. The House Mouse, mus musculus. There are at least 30 known species of mouse, the most common is known as the house mouse for its close connection to mankind’s homes. They have poor eyesight but excellent senses of hearing and smell. Prolific breeders and omnivores, they are small but also know disease carriers. Maintaining a rodent-free residence or business will take some action on the owner’s part as well as regular attention from a qualified Bloomington pest control agent. In order to safeguard your home or business, you will need to prevent rodent infestation, inspect regularly for their presence and treat any problems are they arise. Habitat alteration. Your agent may suggest making changes to the environs of your home to make it less attractive to rodents. For example, cutting back tree limbs that overhang your roof can help keep roof rats from gaining access to your attic spaces. Exclusion. There are many methods of excluding mice and rats from your home. Caulking small foundation cracks and screening vents can help prevent pests. Sanitation. The use of this term does not indicate any judgment on the cleanliness of a home or office. It means keeping potential food sources away from the rodent’s keen sense of smell. Procedures like using tightly lidded trash cans and moving grass seed off the garage floor are considered “sanitation”. Regular check-ups are a good idea to keep rodents from populating your home. Your pest control agent will search the areas of your home rodents are known to frequent. Crawlspaces, attics, baseboards, vents and ducts will all be examined for evidence of mice and rats. Here are a few things your agent will be seeking. Droppings. Rodent droppings are one of the most obvious signs of an infestation. Your agent will be checking to see if the droppings are in large or small in size and in quantity and if they are old or new. Size is an indicator of the type of rodent leaving the dropping. Body marks. Mice and rats leave greasy marks of walls and baseboards. They usually run along the perimeter of a space, rubbing their side against the wall. Their oily bodies attract dirt so they leave smudge marks on the walls and baseboards they frequent. Gnawed edges. Mice and rats will gnaw on things to control the growth of their teeth as well as for food. 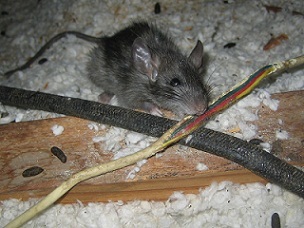 Your agent will examine your furniture, walls and other areas rodent like to chew. Nests. Mice and rats create nests out of soft materials they gather. Your technician should look for nests in quiet, dark spaces and in insulation. If a rodent or evidence of one is found, your pest control technician will alter you and discuss treatment options. Traps, baits and chemical options should be carefully considered as treatments. Talk about the potential side effects as well as the efficiency of the treatment. Rodent prevention is a serious subject for home and business owners. Make sure your pest control company is expert in treating this complex issue.